"Flash poll! How many Bibles do you have in your house?" That was the start of a post I made on Facebook a little while back. The discussion that followed unexpectedly became quite heated, and I wanted to address some of the things we talked about in that thread here in my blog. This will also be the first in a mini-series of posts about the Bible that I've been wanting to do for some time; stick with me this week and next week and see where this goes! Also, although I don't mention this very often, it's always true: the comments area is open for comments and even discussion. I personally approve each comment so that I don't wind up with a bunch of spam or profanity or whatever on the blog, but I don't censor honest differences of opinion. So comment away! At my house I have more than twenty physical Bibles, most of which are full Bibles instead of just New Testaments. (My friends reported having as few as 2 physical Bibles, and as many as 15-19.) 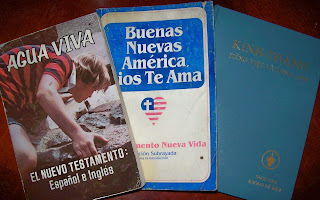 The Bibles you see pictured above came through many different channels before they wound up on my bookshelf, and I want to tell a few of those stories, but first I want to address something: 1980s Translation Fever. I grew up in the 1970s and 1980s. Prior to the 1970s in the United States (and keep in mind that I am not a historian, so you may be getting a view that is slightly skewed by my own experience) the King James Bible pretty much reigned supreme in Protestant churches. Oh, there were other translations out there... the American Standard Version had been out since 1901, and the modern revision of it, the Revised Standard Version, had been released in the early 1950s. But I never saw much of those translations growing up. What I did see were more and more brand-NEW Bible versions popping up. The Living Bible, which is actually a paraphrase of the 1901 ASV and not a translation (but who understood about that back then?) came out in 1971. The Good News Bible, which actually is a new translation designed to be much easier to read, came out about five years later, followed closely by a translation that has enjoyed an incredible amount of popularity ever since, the New International Version. The early 80s saw the New King James Version in the Christian bookstores. I'm not at all trying to name every single translation that came out, because I've almost certainly missed some, but those are the ones that turned up on my "Hey, I can understand this Bible!" Christian kid radar. All that to say, back in the day there were extremely good reasons for having two or even three or four translations at your disposal. And remember, for those of you younger than thirty years old, that personal computers were in their infancy then. They were very slow, and no home computer had enough memory to even think about holding even one entire Bible text in memory at a time. The first time I saw a computer Bible I was in high school, and it was King James and it was on about a dozen floppy discs (each of which could hold about 90kB of information... one "kB" is one one-thousandth of a megabyte!) and to search the whole Bible you had to put each disk in, one at a time, and wait several minutes while it searched that part. It took FOR EVER. Hard disks were a strange new world in those days; not many people had them. So in order to have multiple translations of the Bible, you had to open up space on a bookshelf. And that's where several of my Bibles came from. I have my first NIV, which I bought for myself with money I was given for college (best purchase I made with that money!) ...you can see the spine of that green-cover Bible, worn to a frazzle, at the bottom of this post. I have a Good News Bible from back then, and a couple of King James Bibles I had as a kid. I have Bible or two that previously belonged to my parents, different translations that they let me keep because they had other copies of them. 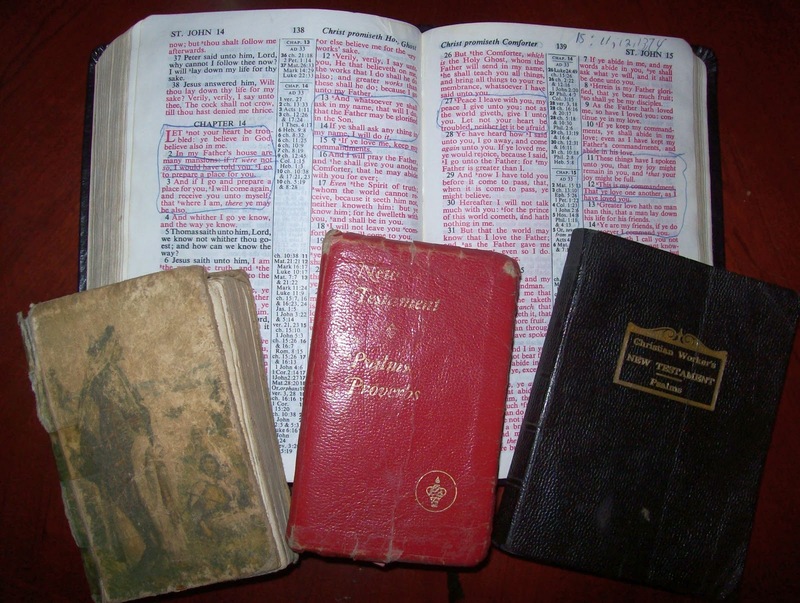 I also have Bibles that I keep for sentimental reasons, like the little red King James Gideon Bible I was given (at school!) in high school. I actually carried that one with me for several years; the cover is about to fall off it, but it reminds me of being a Christian in high school. It's something I can show my own children one day if they wonder what I think about having a Bible at school. I have one or two beat-up Bibles that I owned as a child; it's fun to look back and see the things I wrote in them based on my limited kid understanding of the Word and the World. I have a Bible, signed "Oral and Richard Roberts", which was given to me when I graduated Oral Roberts University (all of the graduates got them). I have another Bible that was given me when I completed the membership class at a church I attended for many years. Those last two Bibles have never been read; for me they are symbols of milestones in my life, and I keep them for that reason. I also have some foreign-language Bibles. One of the Spanish Bibles I have is actually a Spanish/English parallel Bible that I was given by my parents to take on a missions trip to Mexico during my college days. My folks signed it, and it's a keepsake that I won't part with (also, the English translation is the RSV, which I don't have another physical copy of). If I remember correctly, the Vietnamese Bible is in my hands because of a small home group I once co-led which consisted of Vietnamese teenagers. I have another Spanish Bible, and I honestly don't remember where that one came from. I don't read Vietnamese at all and I don't read Spanish very well, so now that I'm thinking about it, I may donate those to congregations in my area who speak those languages. But they also represent seasons of my life, so it's nice to have them around for that reason. For a long time after I bought my green NIV when I went off to college I didn't buy any new Bibles. I had what I needed, I loved my NIV, it fed me the Word. But when the English Standard Version came out a decade ago, I became very interested and bought a new one for myself (it's the translation I generally quote on this blog). The release of the ESV Study Bible piqued in me a new interest in study Bibles, which I had had limited exposure to before then, and now (as you know if you've been reading this blog for a while), I'm darn near obsessed. Many study Bibles are almost like a Bible and a commentary in one book, and I love being able to gain background information and insights along with my reading. So most of my recent Bible purchases have been study Bibles, although I've been trying to diversify the number of translations I pick up at the same time. 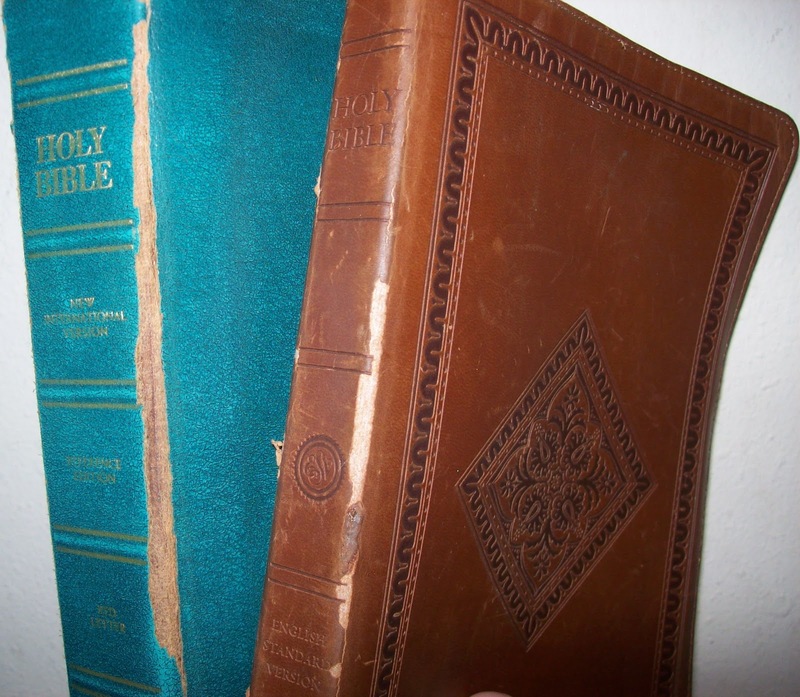 Is twenty Bibles too many? Twenty-five? Thirty? How about a hundred? A large Christian bookstore could quite easily have fifteen or twenty different translations on their shelves, and if you went shopping online you could find thirty or forty different translations (legitimate ones; I'm not even counting fringe translations, cult translations, etc.). Heck, there are currently four different versions just of the NIV, with a new one on the way to be published this year. How many do you need? How many is it okay to have? Well, the fact is, the Word of God is the Word of God, and as long as the people who translated your Bible were seeking to represent the truth of the Word to the best of their abilities, if you enjoy reading that Bible and spending time learning from it, that's the only Bible you need. That one Bible will serve you well for a lifetime. But what if you like reading different translations? Comparing, contrasting, seeing different aspects of the text in different phrasings? Is it bad to have many Bibles? Obviously, my answer is going to have to be "no!" It's not bad to have many Bibles. And honestly, if you live in the United States of America, you're not taking a Bible out of someone else's hand to have a new Bible. We're cranking out new ones every day, and if someone wants a Bible, there are churches and parachurch organizations (like the Gideons) who will give them their own Bible for the asking. In fact, if someone asked me for a Bible, I wouldn't hesitate to give them one of mine, or even buy them their own; I have some little paperback ESV New Testaments that I bought specifically for this purpose. Yes, there are people in other countries who have one Bible for their whole entire underground church, or who don't have access to a Bible at all... but if I didn't have the ESV Study Bible that's sitting on my nightstand, they wouldn't have it either. The guy who walked into the Christian bookstore after I did would have it on his nightstand. BUT: if you are concerned about peoples across the World who do not have access to the Bible, I encourage you to look into organizations such as Wycliffe Bible Translators, which supports missionaries who translate the Bible into languages which do not have it yet, or the American Bible Society or International Bible Society which send Bibles to places where they are needed and wanted. Get involved financially, or get involved in missions work or volunteer work within those organizations. Enjoy the Bible(s) you have at home, and make it possible for someone else to experience that same joy! There's an old saying that if you don't have a red Bible, you might as well not even have a Bible. Oh, did I say "red?" I meant read. If you don't have a read Bible, you might as well not even have a Bible. If you haven't read it, it's not in your heart, and God can't really use the Bible on your shelf to change your life. Only by putting the Word of God in your heart can you gain any benefit from it. So no matter if you have one Bible or fifty, READ. Open them. Study them. Read the notes and follow the cross-references. Find out what God's Word has to say to you. Because no matter how many books you have on your shelf, the one Bible that really matters is the one you have in your heart. When I read The Narnia Code a month or so ago, I found myself convinced but vaguely unsatisfied. I saw that Michael Ward had a good case on his hands, but it seemed somehow incomplete to me. But I had heard that his earlier book, Planet Narnia, was a "more scholarly" work that covered much of the same ground. That statement is correct... it is more "scholarly" and it does cover a lot of the same ground... but boy oh BOY is it more than just a wordier version of the same thing! Planet Narnia goes places that The Narnia Code wouldn't dream of going. I covered the basics of Ward's planetary theory about the Chronicles in my review of The Narnia Code, so I won't go through all that again here. Much of the material is exactly the same between the two books; if you read both you will even recognize some of the sentences they have in common (I understand that NC is a revision of PN). But the two books approach the subject from different directions. NC treats the whole thing kind of like a mystery story; the first chapter is actually called "The Mystery," and Ward goes to great lengths making the point that people have wondered about a common theme in the Chronicles but have not been able to figure it out. PN gets right into the meat of the matter, not making a big deal out of the mystery but diving right into the scholarship of the matter. It's not necessarily a better or worse approach; I think the NC approach is probably more appealing to someone who does light reading for pleasure, since it has that air of a good mystery story about it, and the PN approach is going to be more engaging for someone who maybe has a more comprehensive knowledge of Lewis' body of work and who wants all the details. And if you're looking for details, Planet Narnia certainly delivers! NC touches briefly on the planets in some of Lewis' other writings, but PN covers all of the connections, from Lewis' poem called "The Planets" to his non-fiction work The Discarded Image to his Space Trilogy and even to some more obscure (even unpublished) works. Ward even occasionally takes a look at works from other authors that Lewis was very likely to have been influenced by. The information is much deeper in PN; the chapters are much longer (I would estimate that it took me at least twice as long to read one of the PN chapters about one of the planets as it took me to read the corresponding chapter in NC, and in some cases maybe three times as long) and the vocabulary is more complex as well. Take this sentence from page 45 as an example: "This focus upon the aestival aspect of Jove's influence was derived, in part, from Lewis's observation of the development of the Criseyde story in post-Chaucerian English poetry." Sometimes I had to read a sentence twice or three times to get the point! If you absolutely don't like three-dollar words, you might stick with NC. You certainly won't breeze through PN; it will take you some work to get through it. But I found the effort rewarding; it was worth every "appurtenance" and "ichneutic" to get to the greater wealth of information in the more detailed book. I've read an awful lot of C.S. Lewis' work. I've read some books about his writings, too, and I even have the book containing the unfinished story fragment called "The Dark Tower" and some other obscure stuff. I'm familiar enough with his corpus that reading this was like seeing for the first time a road through territory with which I was already basically familiar. If you're not as big a fan as I, you may not enjoy it so much. In fact, if you've read the Chronicles but haven't read the Space Trilogy (Out Of The Silent Planet, Perelandra, That Hideous Strength) I would recommend taking in the Space Trilogy before tackling Planet Narnia; Ward talks quite a lot about the Space Trilogy in PN, seeing in it some of the seeds of the idea of writing a whole series with the planets as an underlying theme. Taking a look at The Discarded Image might be helpful too, but I would consider that less of a prerequisite than the Space Trilogy. Once you're familiar with the Chronicles and the Space Trilogy, though, if you're ready for a wild ride through the imagination of C.S. Lewis, dive right in! For true C.S. Lewis fans, this book is a real eye-opener and a lot of fun. Give it a look! Last night I finished Song of Solomon, which means that I've finally reached a part of the Bible that was one of the major reasons I started this project: the prophetic books! I've read some of them already... Jonah of course, and I've always been a big fan of the book of Daniel... but I'm so excited to get into Isaiah, which I believe is the Old Testament book most quoted by the New Testament and which contains MAJOR prophecies about the time in which it was written in addition to the time of the Messiah. (I actually started Isaiah once before I started my whole-Bible project, but I didn't get very far.) But I really hope to gain a working knowledge of all of the OT prophetic books. It's a part of the Bible in which I've spent very little time (I suspect I'm in the company of most Christians in the regard), and if "All Scripture is breathed out by God and profitable for teaching, for reproof, for correction, and for training in righteousness, that the man of God may be competent, equipped for every good work," (2 Timothy 3:16-17 ESV, emphasis mine) then I want to be familiar with all of it if I can. This morning in church I was struck again with something that's been a large part of my worship experience since I wandered deep into the Old Testament last year. The thing that keeps coming to my mind is God's faithfulness to His people over the course of many centuries. He has never given up on us, He has continued to love us, all the way from the fall of Adam through Noah and Abraham and Joseph and Moses, through Godly leaders and through unGodly leaders, through our faithfulness and our apostasy, on and on through thousands of years of time, right up to now. God is still faithful to His people. It gets me every time! In context, Jesus was taking a number of serious transgressions of the Law (lust, divorce, breaking an oath, etc.) and saying that once the deed is done in your heart, it's as sinful as if you had done it for real. In this case, though, Jesus is basically saying that if you speak out to someone in anger, it is tantamount to murdering them. And I got to thinking about my relationship with my kids. Are there any parents in existence who don't ever get frustrated and angry with their kids? I doubt it! Kids are kids... they haven't learned how to act like adults yet, and they haven't become as emotionally and mentally mature as their parents (hopefully) have, and sometimes we see blossoming in them things that we once struggled with and finally defeated. Emotionally it's like finally clearing your yard of dandelions, and then the next day waking up to see the whole yard yellow again. I certainly know that I've raised my voice to my children in anger before! I try to be very careful when correcting my children, and always tell them that even if they've done something stupid (messing with something that could hurt them, going somewhere dangerous, etc.) it doesn't mean that they are stupid... it means that their actions were stupid, even though they are both very smart kids. But I wonder if raising my voice to them in anger actually really does kill something inside of them. I don't want to be the murderer of any part of my children; I'll be reevaluating how I communicate with them in those kinds of situations. I think God can teach me how to always be someone who heals and reconciles and never someone who kills with my words. Tonight during worship we sang several songs (including those quoted above) that described God in terms of "light" and "fire." That's one of my favorite images of God; not only does He illuminate and bring clarity, but He also burns up the bad stuff and purifies us until there's nothing but good stuff left (or, at least we approach that goal more and more as we let Him refine us and root out the messy parts of our lives and personalities). Being purified is usually an uncomfortable process, but when it's over, the result is something much better than what existed before! My pastor briefly mentioned during worship that we should praise God for answers to prayer even before we see them... the easy example of this is Jericho, where the people shouted victory before the walls fell down. And Pastor said that this way of thinking is totally counter to our way of thinking as human beings, which is true, but it got me thinking: if human beings have one way of seeing something, and God has another way, and they are opposite, which one is the valid way? God's way, of course! God's way is: (1) we ask, (2) we believe His statement that when we ask we will receive, and (3) we begin to celebrate the answer even though it's not here yet. It's like getting word that your Christmas present is on the way by mail. You know you're going to get what you wanted, so why not rejoice? Instead, our "natural" impulse is to wait until we have the answer in our hands before we rejoice. It's like Grandma telling you that that Christmas present is in the mail, and you choosing to be skeptical about whether she is telling you the truth or not. Looked at it that way, which is the truly "natural" attitude to have: the "human being" way, or the "God" way? Maybe the reason we don't rejoice is because we think that we may not be asking within the parameters of God's will. To solve that problem, we have to get God's Word into our hearts. I'll be posting a short series about the Bible soon; it's so critical to living the life God wants for us that we dig into God's Word! If you don't know if what you're praying is God's will or not, check the Book (which is MUCH easier to do if you already have a good grasp of what it says in there!) and get sure. Then pray according to the Will of God, and REJOICE!